Our range of products include dentacam sd intra oral camera, intra oral camera, intra oral sd memory camera, intra oral dental dentacam dlx plus camera and dentacam tv lm model camera. Dentacam SD Intra Oral Camera is used to freeze and capture images directly on TV or computers. Sourced from reliable partners, these are offered with in-built SD cards. These are simple to use and are offered at economical prices. For our esteemed clients based across the country, we assemble a premium collection of Intra Oral Camera. This a truly auto focus, anti-fog camera in the real sense.The probe size of the camera is also quite small. With the support of our skilled professionals, we are engaged in manufacturing, importing to our customers a wide array of Intra Oral SD Memory Camera. Intra Oral Dental Dentacam DLX Plus Camera makes medical treatment simple and easy. 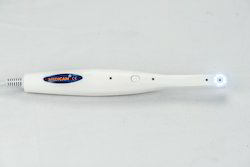 It increases efficiency and shortens the time of each treatment process. It eliminates patient's worries about treatment by offering clear communication between the dentist and patient.